Our current exhibition “Enchanted Vision” showcases some of the works from the Arthur Rackham Collection held here at the RBML. Rackham, a British illustrator, illustrated 50 major works beginning with Rip Van Winkle in 1905, Alice in Wonderland, A Midsummer Night’s Dream, Winnie the Pooh, and other English and American classics. As a companion to this exhibition, the University Archives has put together some materials to highlight the Collection’s origin and history at Columbia. 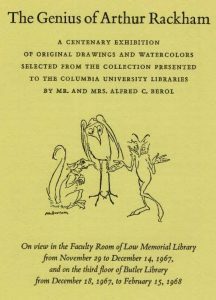 In 1956 Mr. and Mrs. Alfred C. Berol donated to the Columbia University Libraries a nearly complete collection of the published works of the famous book illustrator, Arthur Rackham. The collection was formed by Sarah Briggs Latimore who, with Grace CIark Haskell, published a definitive bibliography of Rackham in 1936. 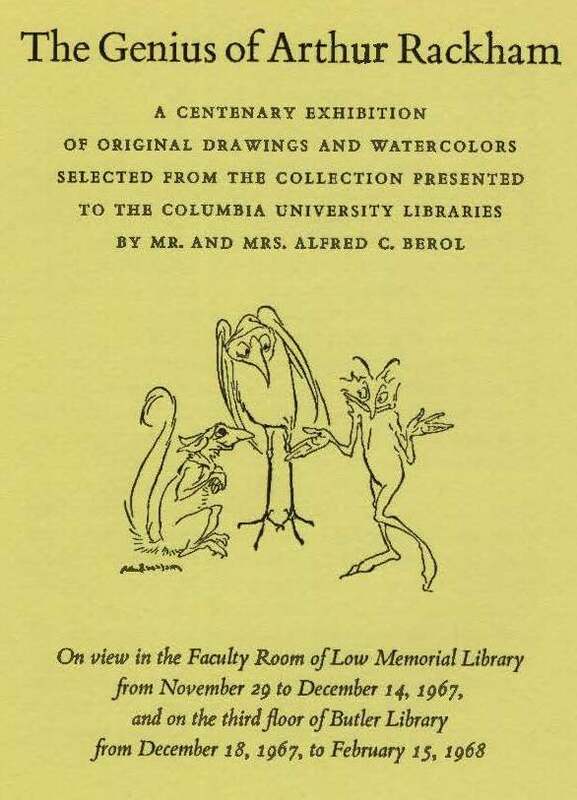 Upon its arrival at Columbia, a selection of this collection was first exhibited at Butler Library in 1956. Cover of the 1967 exhibition program, RBML Office Files. The illustration was from Arthur Rackham’s Christmas card for 1926. After the original gift of almost four hundred pieces of published works in books and magazines, the Berols continued to add to the Rackham Collection over the years. They donated unpublished, original artwork: watercolor paintings, pen-and-ink sketches, and a self-portrait in oil, including the unfinished needlepoint made by Rackham as a boy (currently on exhibit). 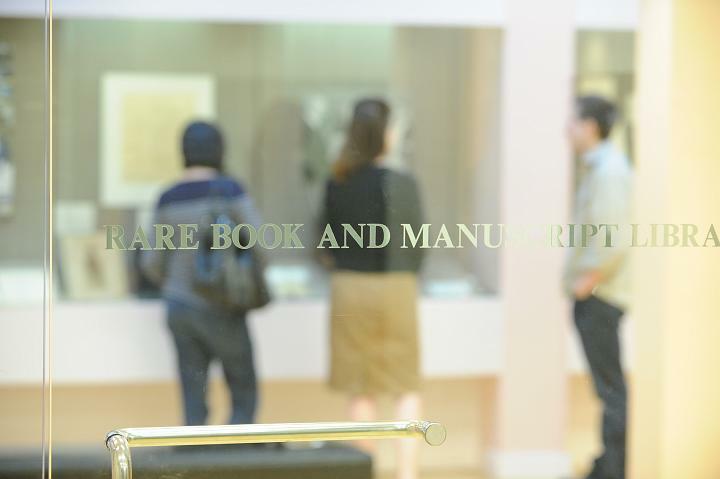 Sketchbooks, work notes for Rackham’s major illustrated editions, drawings, drafts and studies in notebooks and correspondence files were also added to the collection. In 1967, the Libraries held a Rackham Centenary Exhibition in the Faculty Room of Low Library. In attendance at the Centenary Exhibition was Mrs. Barbara Edwards, Arthur Rackham’s only child. After returning to her home in Basingstoke, England, Edwards donated to the Libraries a watercolor drawing and the paint box, as left by the artist when he used it for the last time (currently on exhibit). In 1991, another major Rackham show was held in the recently remodeled RBML gallery space, which featured not only the Berols gifts but also those of George M. Jaffin, Helen Macy and Barbara Edwards. This summer’s display at the RBML is the latest exhibition of this material in the 62 years it has been with Columbia and speaks to the enduring appeal of Arthur Rackham’s artwork. This entry was posted in Comics and Cartoons and tagged Arthur Rackham, exhibition, illustrations on July 24, 2018 by Columbia Rare Book & Manuscript Library.